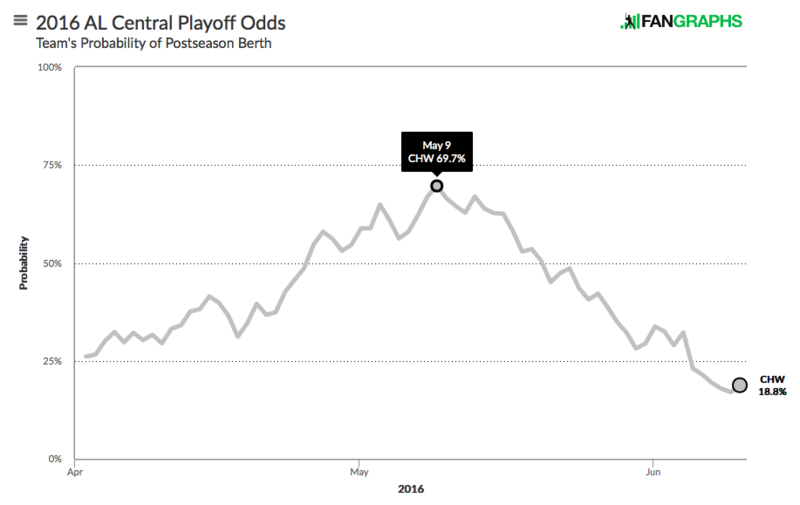 Over the last month, the White Sox have gone 7-20, plummeting to fourth place in the American League Central and dropping their playoff odds below their Opening Day mark. #WhiteSox have designated Jimmy Rollins for assignment to make space for Tim Anderson. Tim Anderson, a shortstop drafted 17th overall by the White Sox in the 2013 draft, was seen by most as the team’s top prospect entering the year, and was ranked as a consensus top-50 prospect in baseball, slotted as high as 19 in BaseballProspectus’ top 101. Anderson’s carrying tool is his plus-plus speed, which draws 70 grades from most evaluators. He stole 49 bases in 62 attempts as a 22-year-old in Double-A last year, and is 11-for-15 in 55 games at Triple-A this season. Despite top-of-the-order speed, though, Anderson does not necessarily profile as a top-of-the-order hitter, due to low on-base skills that stem from a non-existant walk rate and above-average strikeout figures thanks to a propensity for chasing breaking balls. Scouts rave about his bat speed and ability to spray fastballs for line drives all over the field, and his minor league BABIPs support Anderson’s profile as a high-average, low-OBP hitter. There have also been questions as to whether Anderson has the ability to stick at shortstop at the major league level, though he’s reportedly improved in recent years. That being said, Jimmy Rollins is 37 and likely at the end of his career while Tyler Saladino is a 26-year-old non-prospect, and neither offers exceptional value on the bases or in the field. Anderson should only get better at 22, and can offer a legitimate weapon with his plus-plus speed that the others can’t. This should be viewed an upgrade, and shaking things up during a slide as nasty as the one Chicago is on right now likely won’t hurt the clubhouse, but Anderson should be viewed more as another piece to a fragmented puzzle than as a savior in Chicago. We hoped you liked reading White Sox Promote Top Prospect Tim Anderson by August Fagerstrom! You’ve got Rollins designated early in the post, then in the last graph say he’s at the end of his career. Needs a little editing. I’m not sure I follow. Both statements are true.